BIG PICTURE: A prominent theme of ecologist Daniel Botkin’s latest book, 25 Myths That Are Destroying the Environment , is that the natural world is more sophisticated than we imagine. Everything is fluid. Numerous interactions are taking place at any given time. On multiple levels and in multiple directions. Between species and within species. The belief that whales and other animals would be peachy keen if only humans weren’t around informs many conservation measures. We’re the skunk at the picnic. We disturb. We perturb. We upset a natural, intrinsic balance. Scientists have tried very hard to see if the [balance of nature] logistic could work for real populations out in the wild; after searching the scientific literature at great length, I’ve found that they have always failed…it has never worked in the real world outside of a laboratory. In physics, when an equation completely fails to make accurate forecasts of real events, it is abandoned…ecologists have done just the opposite of physicists: They have continued to use an equation that has never matched real-world observations. 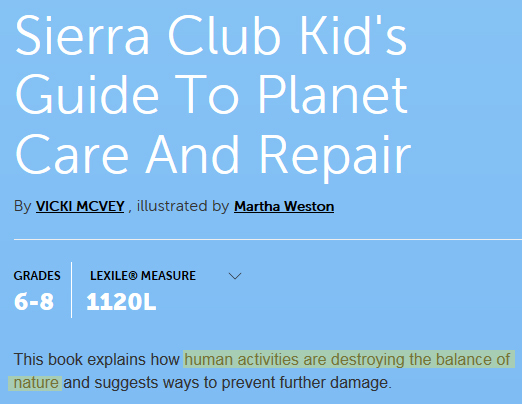 Why do the WWF, the Sierra Club, and the Canadian Wildlife Federation continue to talk about the ‘balance of nature’? Perhaps because it inflates humanity’s importance. It places us at the center of the drama. It casts us as directors of the play, and stars of the show. How bizarre that professional environmentalists are in the business of dismissing and diminishing highly potent, natural forces. TOP TAKEAWAY: The ‘balance of nature’ idea is folklore – a persuasive idea for which there is no evidence. → Receive posts via e-mail by signing up on the right side of this page, above – or by following this blog on Facebook and Twitter. → Download or e-mail a PDF of this post by clicking the Print button under Share This below – then select the blue arrow beside PDF at the bottom left. This entry was posted on July 4, 2018 by Donna Laframboise in NGOs, quotations, World Wildlife Fund and tagged Canadian Wildlife Federation, Daniel Botkin, Sierra Club, World Wildlife Fund, WWF.